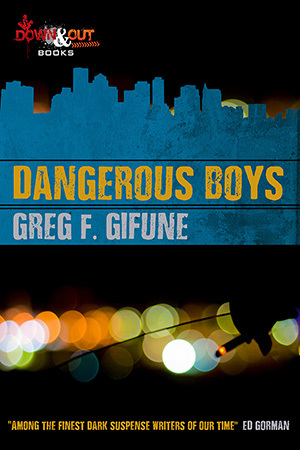 TAMPA, Fla. - Dec. 21, 2017 - PRLog -- Down & Out Books is pleased to announce that DANGEROUS BOYS by Greg F. Gifune will be published on March 5, 2018 in trade paperback and ebook formats. Summer, 1984. For Richie Lionetti and his gang of friends, their years as teenagers are coming to an end. At a crossroad in their lives as petty criminals and thugs on the mean streets of New Bedford, Massachusetts, they've got one final summer, one last chance to fall in love, brawl for their turf, rob and pillage, and one last chance to make a move and pull a job that could change their lives forever. Part coming-of-age tale, part dark crime thriller, Dangerous Boys is the story of a group of young punks with nothing left to lose, fighting to find themselves, their futures, and a way out of the madness and darkness before it's too late. Greg F. Gifune is a bestselling, internationally-published author of several acclaimed novels, novellas and two short story collections. Working predominantly in the crime and horror genres, Greg has been called "The best writer of horror and thrillers at work today" by New York Times bestselling author Christopher Rice, "One of the best writers of his generation" by both The Roswell Literary Review and horror grandmaster Brian Keene, and "Among the finest dark suspense writers of our time" by legendary bestselling author Ed Gorman. Greg's work has been translated into several languages, received starred reviews from Publishers Weekly, Library Journal, Kirkus and others, is consistently praised by readers and critics alike, and has garnered attention from Hollywood. Greg resides in Massachusetts with his wife Carol, a few cats and two dogs, Dozer and Bella. Celebrating six years as an independent publisher of award-winning literary and crime fiction, Down & Out Books (https://downandoutbooks.com) is based in Tampa, Florida. For more information about the book, to request a review copy of the book, or to inquire about an interview with the author, contact lance@downandoutbooks.com.